Pondmaking came into my life because of a mollusc problem. Mollusc Paradise could have been the name of my first house. In the garden newly purchased plants were vanishing. Slugs and snails were devastating my expensive plants, but I wanted to avoid poisoning my first proper garden and somebody told me that frogs and toads ate slugs and snails. Then I read in my local newspaper that a well-established nearby pond had masses of surplus frogspawn. A few days later I was exploring a nursery that sold water-feature equipment, and I saw a vehicle marked "BORROVAN". It was parked beside a pile of pre-formed garden ponds. "You borrow the van to take your pond home and when you return it, we give you back your car". Pond, frogspawn, tadpoles, frogs, I thought and minutes later was the proud owner of my very first pond liner. The best time to dig a new pond is late summer while the water is still warm enough to handle, before the plants stop growing and while pond-owners are thinning out their plants. You are less likely to have green-water problems than if you start in the spring. There are 3 main ways to line a pond: concrete, waterproof material or a pre-formed shell. 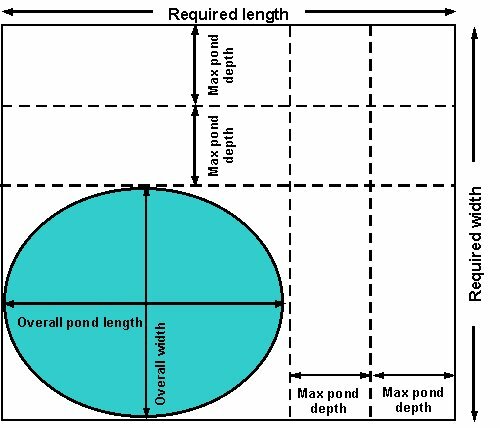 Be very careful what material you select to line your pond; unless you select a very simple shape, pre-formed ponds are a menace. The one I chose to take home in the Borrovan was shaped like the lid of a grand piano, which may sound very pretty but have you ever tried digging a hole not only shaped like a grand piano, but exactly the right size? And several different depths? A couple of years later, one side of the plastic pond was sinking and the opposite side was becoming exposed to the sun and starting to crack. So when another couple of years had gone by and the original two pairs of frogs had become several hundred at spawning, it was time to think bigger and try a better liner. Frogs, toads and newts usually return to the pond from which they emerged, and spawn when they are about 3 years old. This means that, barring accidents involving diseases, herons, cats, etc., one dollop of spawn produces thousands (up to 4000) of tadpoles and hundreds of tiny frogs the first year, many of which come back every year, and once they start spawning the arithmetic gets a bit mind-boggling. So it is worth thinking big from the start. All the experts say make your pond as big as your space and your budget will allow and this is good advice. If I had consulted them before buying the grand-piano-pond (pond 1, maximum length just under 2m), I would have done what I did with my second, much bigger pond (pond 2, maximum length about 2.75m): I took out a mortgage to buy the best quality butyl liner and filled what was left of the garden with an almost perfectly circular pond. Ponds 1 and 2 were installed in the narrow garden of a terraced house in London. By the time of pond 3 I had moved to Devon and acquired a larger garden and now made another fundamental mistake. The new pond was going to be nearly 6m long and when I calculated the cost of good quality butyl, I had a brainstorm and bought a less expensive PVC. Four years later, despite following all the rules for preparing the hole (see below), this liner was leaking and the pond had to be emptied and mended. It had been punctured many times by small sharp pieces of gravel. The source of these stones was and remains a mystery; my suspicion is that roots from a willow tree growing nearby had pushed bits of gravel between the liner and the layer of protective carpet. I may also have been careless while moving large pots of lilies about and I would recommend that you do not drag any large object across the liner in case sharp stones have fallen in. However, this disaster provided the opportunity to examine in detail the wildlife which had succeeded in establishing itself, and this led to the dramatic decision to exclude fish altogether (see Fish or No Fish). Liner summary: buy the best quality you can afford, ideally a material that stretches as it fills so that it moulds to fit your hole without too many lumpy folds. To calculate what length to buy see diagram A. If you have limited choice of liner material, be sure to check the widths on offer as you cannot use several pieces or the water will leak out.